The Early Intervention Program serves children from birth to age three. Therapies are provided by a certified teacher and developmental specialist to help each child reach their developmental milestones and to help parents participate in the development of their child. Speech therapy, physical therapy, and occupational therapy are provided as prescribed by a physician and are offered in the ERC Child Development Centers. The goal of the Early Intervention program at ERC is to assist very young children, from 6 weeks to 3 years of age who have been diagnosed with developmental delays and disabilities, reach their developmental milestones and meet their full potential. These Early Intervention services are provided to children and their parents and/or caregivers to help lessen the effects of the conditions that are causing (or could cause) delays in development. The program is based on a team approach that provides families with the resources, support and knowledge needed to insure their child’s success. 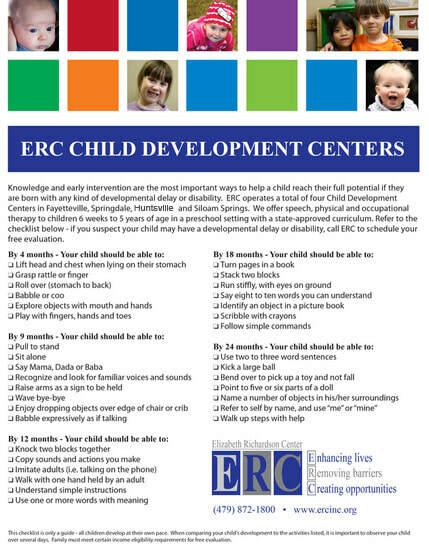 To learn more about the ERC Early Intervention program or to begin the admission process, please contact the Child Development Center location nearest you. View our Developmental Checklist to check on general guidelines for a child's developmental milestones. To maximize the child's and the family's benefit to society.